Hi, I’m a new member. I’ve been interested in SIB’s since I was young and built a few when my hands and eyes were in better shape. I’m finding that my eyes now have actually improved for close up work as I’ve gotten older so I’ve renewed my interest in building ship models. I have a minor collection of SIBs which I may post a few of later. Unfortunately, I gave away as gifts all the best examples that I made myself and few survived their new ownership. What got me interested in SIBs was this model I found in the basement of the house we moved into on Long Island, New York in June, 1964. The house was a typical post-WWII tract home probably built in the late 1940’s, early 1950’s and we purchased from the original owners. I kept this model in my bedroom when I was growing up and have had it with me ever since. I never thought to research it until recently so here I am. I’ve done some minor investigation at least of the bottle. Since I found the model in 1964, its construction certainly predates that. The bottle has a screw cap thread which weren’t invented until about 1910. It must be a machine made bottle and to me it looks like a typical one fifth whiskey bottle – say like Dewar’s White Label Scotch or such. The mouth of the bottle is about say 5/8’s of an inch in inner diameter, typical for a whiskey bottle. There are no markings or words embossed in the bottle with the exception of a dimple on the base which may be an imperfection or a poorly formed maker’s mark. If I tilt the bottle at an angle in looks like it may be an anchor but not an anchor with an H or box around it. This might suggest Anchor Cap and Closure but not Anchor Hocking however it isn’t clear enough to be sure. Anchor Hocking wasn’t incorporated as such until 1937 but Anchor Cap and Closure was in business starting 1913. Of course without any clear markings I can’t even be sure the bottle was made in the USA but from all apparent signs it appears to be a liquor bottle and if it contained liquor that was sold in the US from 1935 to 1964 it would have to have been imprinted with words stating that the US Government forbids its reuse. So, assuming it is indeed a liquor bottle it could have been filled with liquor some time from 1910 to 1935. The US had a prohibition on liquor sales from 1920 to 1933 but there was no prohibition on the production of liquor bottles which could have been exported say to Canada or Scotland. So, it could also be a bottle that contained liquor that was illegally imported during prohibition. Ok, so that says something about the bottle, which had to pre-exist the ship. So the bottle could have been full or empty for sometime before the ship got put in it. 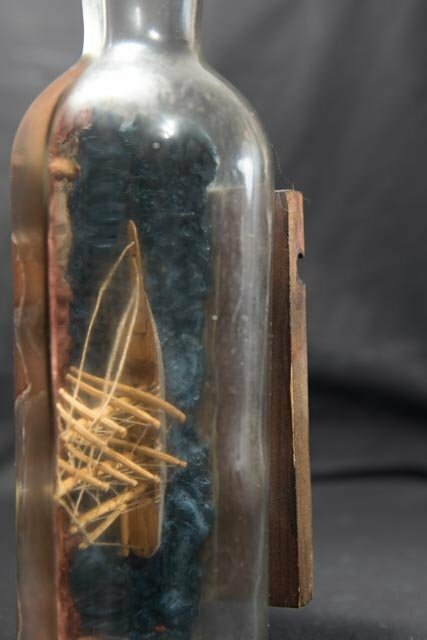 It could also be a bottle that was manufactured for a company specifically for ship in the bottle kits so no markings would have been needed to be applied or some other non-liquor application. I need to disclose that I performed some repairs and modifications of the model as it exist today. I added the wooden base and I replaced the cork that I think was originally sealed with wax because I wanted to re-glue a stay that had pulled out of the bowsprit. I believe this was the middle one that is sagging a bit. I also added the Turk’s Head knot on the bottle neck. 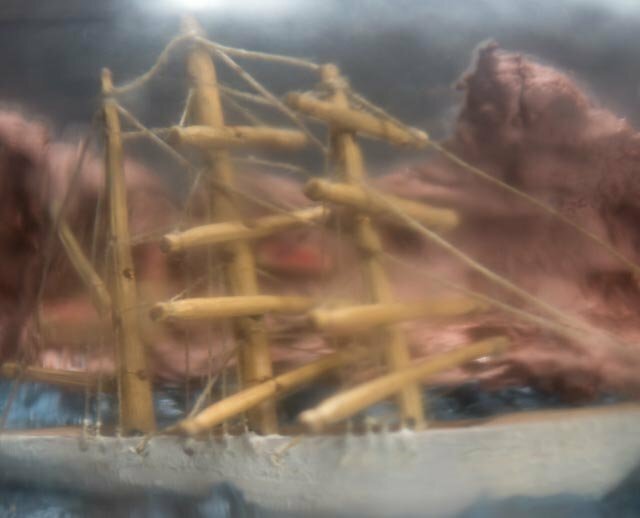 The ship and sea and background are as they were when I found the model. The model is a paradox of crudeness mixed with artistry. 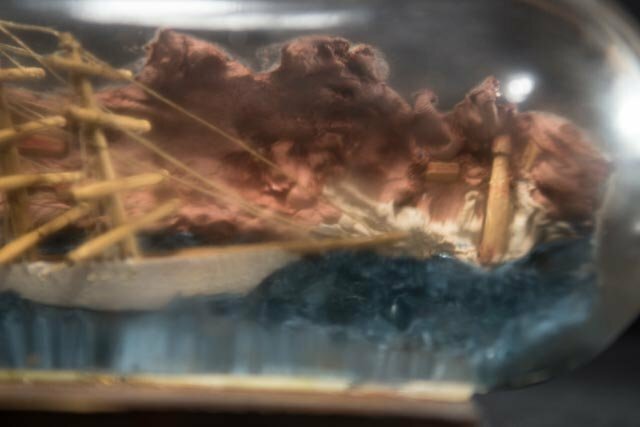 The hull looks roughly hewn, the main deck is roughly chiseled out and the white paint on the hull is lumpy and poorly applied which makes me think the wood didn’t take the paint well. The hull was probably not sanded well or primed and the wood seems like it may be an open grain wood like pine. The deck, masts and spars seem stained but not varnished. The main stays are of some rough cord, not thread. The mast and yard arms are rough and not sanded and shaped and seem to be made from some type of rough wood, not dowels or tooth picks. The masts are hinged to the deck with metal wire like hinges that may be copper or brass. However, the bow is so nicely formed it looks like it could have been machine carved and the bowsprit is joined to the hull with small wooden tendons and are very flush in a neat piece of joinery. The spars, gaffs and booms are joined to the mast with what looks like very fine brass wire that is very neatly twisted. I say brass wire because after all these years it is as bright as ever with no signs of corrosion. The shrouds also are neatly formed from thin thread and are neatly knotted in some very fine work. But what still awes me after all these years is the artistry that was applied to the headland in the background. The lighthouse and small buildings are neatly constructed and applied with care with a neat flourish of white foam. Initially I assumed that one of the kids that lived in the house before us had made it but I doubt a young kid could have made all that background look so convincing. The model looked like it was purposely left behind on the empty shelf case in the basement. No one ever placed any significance on it to inform the previous owners that it was left behind. For a long time it sat untouched on the shelf in upright position because it would otherwise roll off a flat surface and couldn’t be displayed. One day I decided to make a base for it and put it in my room. I never actually considered it was mine, it belonged to the house. So here I submit to you experts my photos of this legend to see if anyone can add to anything I’ve determined. For all I know this could have been a kit model from the 1940’s or 50’s that was popular for its day or it could be an authentic model from an Old Salt in say the 1930’s. Please opine freely. Hi Lubber123, I sent you a pm from gmail. Did you get it? 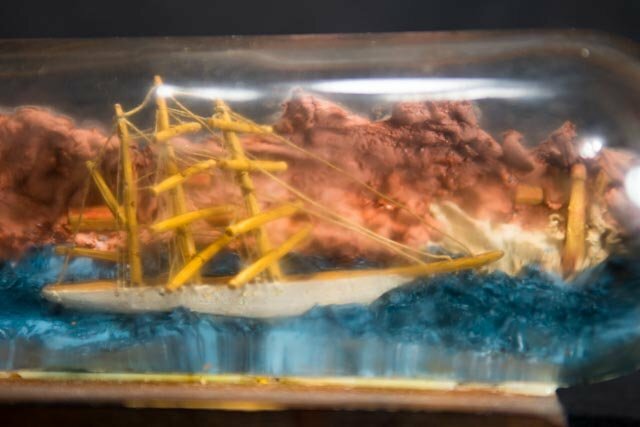 The only kits I know of from the 1950s were built by a company called ship yard and it had a plastic bottle that came in two pieces and had yo be glued together with the ship in the middle. Unless there are other kits I don't know, which is likely, I don't think this is a kit. I don't know that I can add much more to the bottle information than you have already contributed. The rounded markings on the base suggest an Owens machine made bottle to me. At earliest it would be 1910 but Owens machines were used into the 1980's which means it could be any where in between. 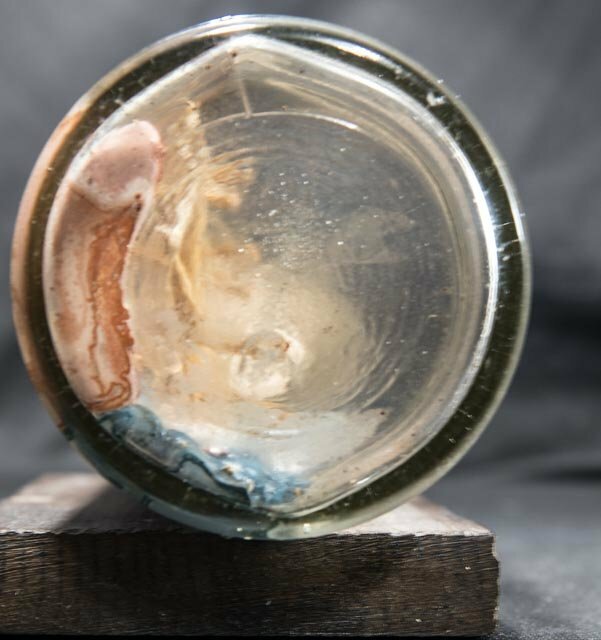 I found an article stating a lot of glass makers in Baltimore used an anchor mark in different variations so its possible it could be from there. It is hard to say. As far as the ship goes the rigging looks accurate as in proper placement of back stays and lifts. Who ever built it knew ships or at the very least had good sources. It is built in an early style in that it doesn't have sails and it depicts a scene. That is typical of sibs I've seen from the 1915ish to the 1920's. Could be its built by an old salt or some one learning from one. It is a rough build. I suspect it could have been one of the builders first models. Might be why it got left behind in the house. Maybe they thought it wasn't as good as later builds but didn't have the heart to throw it away so leave it as treasure. It really is hard to say. 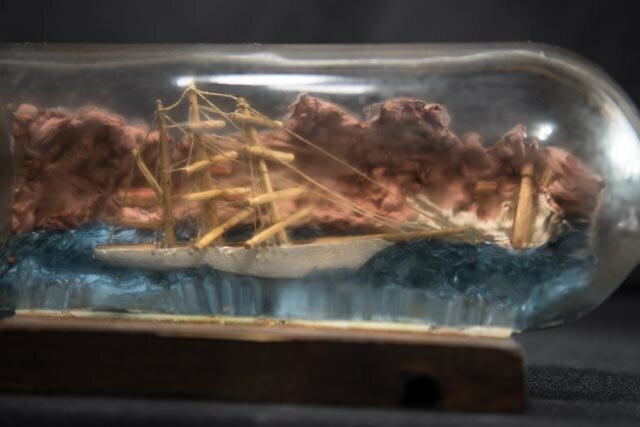 Its a fun little ship in bottle though and the story behind it is interesting. Thank you for sharing it. There's an article in the Bottled Ship Wright Journal (see under 'Clubs' above) on this subject that may help you out a bit.